LOTS of people have asked for my recommendations of which types of water to use. So, I had to do a LOT of research. I examined water for drinking, water for bathing, water for cooking, and water for cleaning. I researched high-priced water, bottled water, filtered water, low-cost water, tap water, and pretty much all types I could find, and ran them all through MY filter: the low-budget, holistic health, longevity filter!! Here is what I found: If you want to get high-priced anti-oxidant water, I know a couple of responsible consultants from whom you can purchase a Kangen unit. Dr. Bo Marley, and Omar Ramirez. Both are VERY nice men, and very attentive and responsible in their respective businesses. We have tried this water, and we did indeed notice some very nice benefits — definite increased energy; deep sleep (except when you have too much of the delicious water, or too late); great flavor; great texture; great taste — even for water, it’s just so yummy, you want to drink more of it. Even stubborn folks who NEVER drink enough water will probably change their habits with this water. That said, I personally don’t want to drink “restructured water” for my ongoing hydration needs. It has been tested for many years and is very popular in some Japanese hospitals, etc… but I am of the mind that God structured the water right to begin with, so I’m wary of it… I see it as “newfangled”, and I’m a little “old-school”. On the filtered water, I looked at Multi-Pur, and all the others, and I’ll save you time: I’ve been using Aquasana for years — it’s just the best, hands-down, all-purpose water. I compared what they filter for, and their respective costs, and the challenges of dealing with each company vs the ease, the responsiveness of the respective merchants, availability of comparison materials, etc. 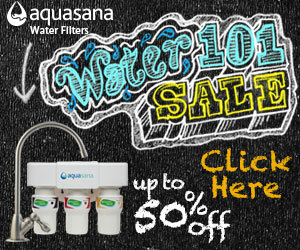 http://mproxy.banner.linksynergy.com/fs/banners/36667/36667_3.jpg You can get a nice set-up for an apartment for under $200 and it will include your kitchen filter and your shower filter, and they have a program called Water for Life, so that they always send the replacement filters automatically. And their support people are always polite and have helped me out on the odd occasion of a billing question or difficulty with replacing the filter or something. They send the filters like clockwork — which is GREAT, cuz we would all forget to do that if it was up to US, right? So I just replace mine when they arrive: set it and forget it. If you own a home, you can get an OUTSIDE unit that filters ALL of the water before it enters your house — SO cool, and economical. You don’t need the chlorine and chemicals inside, but it keeps it safe until it gets there. Aquasana also sells glass bottles, which are very cool, very convenient, 2 perfect sizes, and they have cozies that come with a strap — GREAT for HIKING!!!!! Another REALLY cool thing about Aquasana water is you can SHOWER in it! This is FANTASTIC. You will probably notice the difference in your skin and hair within 4-8 days. Just softer, and more relaxed once you are no longer barraged with chlorine, etc. Remember: Showering can be a prayer, or a meditation. Appreciate your body, appreciate the water, cleanse yourself inside and out, be present, enjoy the sensual experience, and thank your Creator, commune with the earth’s elements. I got this idea while reading The Four Agreements a few years ago. But we all know that some of our most genius ideas “flow” while showering, right? If you are lucky enough to have a life partner, shout out to them to write your idea down before it “slips down the drain”. Psoriasis — at your wits’ end, socially, physically, emotionally? Are Low Salt Diets Deadly?